Jared Unzipped: A Short Note On North Carolina Moped Drivers. 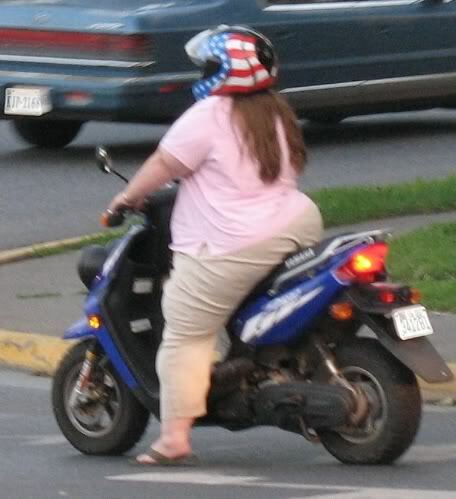 At least she's wearing a helmet? I watched as a moped unsafely whipped ahead of a line of cars this morning while driving, only for said moped to delay traffic and unreasonably slow everyone down. And yet, that moped is allowed on public North Carolina roadways without a licensed operator. I realize that some other states require moped operators to be licensed. North Carolina should do the same. Test people in the much the same manner as motorcyclists. Require that they possess the proper insurance. Make sure that everyone operating a motor vehicle has been evaluated and deemed responsible enough to share the highway, moped drivers included. More importantly, hold moped drivers in equal regard with other drivers. If they're caught driving while intoxicated, they must face the same penalties as drivers operating trucks, motorcycles and cars. Mopeds are involved in hundreds of accidents every year. Mopeds can and do kill people. All drivers operating a motor-powered vehicle on the highway must be held to the same standard. Period.